Ever since childhood I remember being in highly homogeneous groups of friends and familial circles. Such circles have the tendency to numb us to differences, an easy sedate living insulated from those different from us. It was not a shock though considering the direction the country and the state is heading when a friend narrated to me in a series of conversation the travails any muslim girl growing up in Manipur would have most probably undergone. “‘Amina Begum’ is one of one such verbal harassment thrown at anyone wearing the hijab or have wrapped herself up in a scarf or chaddar,” she explained. People like us who are not subject to such particular harassment and targeting based on religious affiliation might even state that such harassment is to be taken lightly. Harassment of such kind is mildly called laknaba, a term as innocuous as eve teasing, a term which could include an array of other activities which are indeed innocuous and thereby makes it difficult for women to argue that laknaba is verbal harassment also, or perhaps what is required is to coin another term which would encompass the ordeal that such an act embodies. While it is more often than not understood and (hopefully) a consensus built around the fact that women undergo harassment at most public and private spaces such harassment of the minorities should be understood as of much more virulent an attack and the fear of being small in numbers is not to be underestimated. The point here is not to compare the degrees of ordeal that women undergo but to state that women belonging to different communities are marked out differently, the minorities always bearing the brunt and in the case of Manipur, the muslims become the other. Just as we are in other parts of the country marked out by our features, they are in their own land marked by other visible markers. Sites that we as “mainstream”, at least in Manipur (by we, I mean the majority community of Manipur, the Meiteis regardless of being hindus or followers of Sanamahi religion) have taken as sacred if looked at through a different lens gives quite an altogether different picture. For instance, Kangla (in the news for quite some time now) has easily morphed from being a site of kingly subjugation to a site of resistance, if only, for the Meiteis. 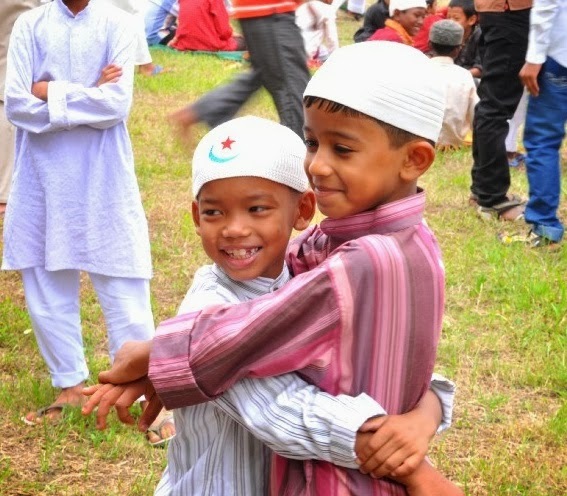 Manipuri muslims or Meitei pangal is the category in the census and such colloquial words –pangal, hao have in time acquired prejudices by what the majority community prefix and suffix with these words that most people with political sensitivity prefer the English replacement –muslim, tribal. A series of conversation with this friend from the Meitei pangal community revealed for me the many flaws of my own community. Her research interest being sacred spaces she interviewed some of the priests in Kangla. It is difficult to identify her as the “other” from her name or her “looks”. She was entertained with her queries for a few days after which she was told in no uncertain terms that she has polluted the space. As a political move there has been many feasts organised in the space of Kangla wherein people from other religious and ethnic communities have been invited, if only for political correctness. The priest also gave her some of his own opinion on how such moves pollute the space of Kangla. Are we to think then that it is only on such marked off days that “the others” are invited, allowed inside the so-called sacred space? It is to be remembered that spaces only become sacred by exclusivity, an exclusivity that more often than not is built on an exclusion, an exclusion that marks certain people as unpolluted and thereby those who are so. It is time we look at such spaces and understand that in the exalted histories of such spaces lie narratives of subjugation/ discrimination. The Meitei hindus of Manipur certainly pride themselves as being separate from hindus of the rest of the country. This is on the basis of the erroneous belief being that they are innocent of discriminatory practices like that of caste. However the notion of purity and pollution has seeped into the very core of all practices. Women are aware of how they are denied access to certain spaces during their menstrual periods. Practices like these have become banal enough to pass unnoticed. We have equally bizarre cases like Municipal Corporation workers sweeping roads being physically and verbally harassed; something as innocuous as the broom has become a potent inauspicious symbol! This idea of purity and pollution also comes in our conduct vis-à-vis the religious and the ethnic minority. My friend was shown the door by a well-known Meitei intellectual. She has polluted his sacred texts was the reason attributed. That we still live in a time where it is possible to make such disparaging statements and not only that, in effect actually rendering certain areas of research inaccessible to a community and also getting away with it is nothing less than shameful and is to be pointed out as a practice of untouchability, an illegal act. She narrated to me an incident wherein she with her sisters travelling in a bus bound for Mayai Lambi was address by an old meitei lady, “Ebemma will you hold these flowers for me, I got them for a puja, the person next to me is a muslim”. I would have been stunned to be address this way. My friend growing up in an everyday of such acts of shunning directed towards her nonchalantly replied “Ema eisu pangan ne” (Mother, I am also a muslim). A remark to which the elderly woman nonchalantly said “Phare adudi, ei adum pairage” (It is okay then, I might as well hold the flowers myself). Would not we see this as an act of untouchability directed towards a community? If this anecdote is amusing I should consider it a failed project to attempt to draw attention to such discriminatory practices. While the name Meitei pangal do suggests the indigeneity of the muslims, the term prefixed as it were, with a meitei, yet the question of indigeneity is a growing and a highly contentious issue. The muslims seems certainly marked out, not only in the state but going by the decade that we live in, in all parts of the country. More, so in the north eastern region of the country, due to its proximity to Bangladesh, muslims have to prove their indigeneity and non-Bangladeshi origin again and again. The Meitei pangal in spite of their indigeneity seemed forever set apart because of their religion. As in other parts of the country in the regressive times we live in the religion seem to question their authenticity as indigenous people of Manipur. All other ethnicities following other institutional religion or those aspiring to be one (Hinduism, Christianity, Sanamahi-ism) at least in the case of Manipur no not at any point of time have to prove themselves as being indigenous population of the state. In fact for those following non-institutional religion, the question does not even arise. At any point of them one can see that there seem to a mortal fear of people who do not constitute even 10% of the population (according to the 2001 census). Not too long ago an incident of muslim villagers lynching a muslim couple in Sora Awang Leikai occupied print and screen space for a weeks. This was used as an illustration of the “otherness” of the meitei pangal. This is strange in a violence ridden place where sporadic killing could be seen anywhere regardless of the religious affiliation of the place. However, the ways in which media possess video recording of the killings and questions of media ethics in such a scenario was not questioned. What was questioned was the ethics of the community and not the ethics of policing mechanism and the manner in which the entire process was video recorded and shown in news bulletin erasing only the most incriminating part. It could be said that issues like the movement asking repeal of AFSPA, resisting acts of violence, resistance to racialised targeting of women from the region in the capital and our indignation against it occupies our time and attention. One should not desist from that. Along with this however it is to be noted that we treat our own minorities with the respect that we demand. While I write this the news of Haji Abdul Salam, first ever Muslim Member of Parliament that the Manipur state is going to see is doing its rounds. The Congress has woken up rather late in the day to the fact that they need to have some secular credential. It is left to be seen if this would translate into any palpable changes in the way we view the meitei pangals. Soibam Haripriya is a doctoral candidate at the Department of Sociology, Delhi School of Economics, University of Delhi; and a poet. Her poems have been published in The Sangai Express (2009-2010) and Our Private Literature (2009-2010). Soibam Haripriya’s poems has been included in an anthology of poems called “Tattooed with Taboos” published by Loktakleima Publications (2011), Imphal, Manipur.